Review: I have to be up front with you and tell you I've never read Dangerous Liaisons and I've never watched the movie. Yet, I was fascinated at the thought of a more modern day telling of a book originally set in 18th century France, in the royal court no less. 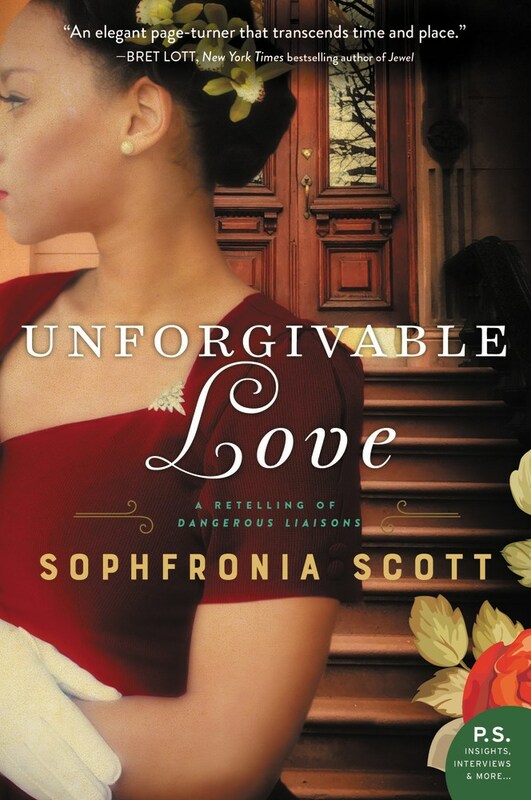 With scenes set in 1940s Harlem and tony Westchester County, Unforgivable Love is full of luscious people and settings. Mae Malveaux is a petty and heartless woman who uses her fame and wealth to control those around her like puppets. Val Jackson is a conquering hero, and while he's bedded most of Harlem, he's never had Mae. And so the two decide to play a game. If Val gives Mae what she wants most, which is revenge, she'll give him what he wants most. Petty McPettington, right? But Val agrees to Mae's foolishness because male pride and dumb ideas typically go hand in hand. Scott creates the perfect ingenue in Cecily. Sent down South by her mother to reign in her free spirited ways, she's newly arrived back in Harlem and she's country dumb. Elizabeth Townsend loves her husband, but as a civil rights attorney, he's traveling the country trying cases like his name is Thurgood. Elizabeth is a virtuous woman with a generous heart and that's what draws Val to her. Though he's more like Mae than he'd care to admit, he strives to be like Elizabeth. These two women are nothing like the fiery Mae, but they are at the center of the game Val is playing on Mae's behalf. Val's aunt, who has raised him since his parents died, may be the only woman Val loves unconditionally and without motive. She's no shrinking violet, in fact, I get the idea that in her heyday, she was as ruthless as Mae, but not as vindictive. In many ways, she's Val's moral compass. I loved so much about this book: the characters, the descriptive scenery, the dialogue. Though the men are important in this story, the contrasting personalities of the women are most fascinating. It's obvious that the author put a lot of thought and care into the characters and details. I'm not sure if Scott plans to continue her journey in writing with more retellings and/or historical fiction, but I sincerely hope she will give it consideration.